My fancy yarn stash. It's just begging to be reinvented into beautiful scarves, shawls, or cowls! Do you have some special skeins of yarn sitting in your stash awaiting greatness? I do! Most came from vacation visits to local yarn stores, though I have some from my Spokane shops, too. 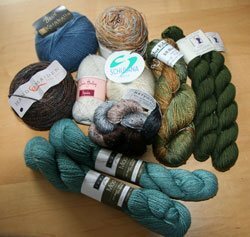 I was looking through my stash in preparation for this newsletter, and I noticed that many of my special yarn purchases have a little metallic content. Shiny! All of my fancy yarn is still in its balls or skeins. That's not very nice, is it? I want to wear my yarn, hopefully sooner than later. Enter Knitting Daily TV. 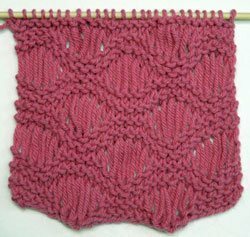 In episode 604, host Eunny Jang demonstrates three easy drop stitch patterns that really pack a wallop for very little effort, and I think any one of them would be perfect for those special skeins! Here's a clip from that show, where Eunny demonstrates all three techniques. Pretty neat, huh? All three of these are easy and turn out beautifully, as you can see. Here are the three stitch patterns. Row 3 (right side): K6, *(yo) twice, k1, (yo) 3 times, k1, (yo) 4 times, k1, (yo) 3 times, k1, (yo) twice, k6; rep from *. Row 4: Knit, dropping all yo's off needle. Row 7: K1, rep from * of Row 3, end last rep k1 instead of k6. Preparation row, right side: K1, *p2, k1, yo, k1, p2, k2; rep from *, end p2, k1. Rows 1, 3, and 5 (wrong side): P1, *k2, p2, k2, p3; rep from *, end k2, p1. Rows 2 and 4: K1, *p2, k3, p2, k2; rep from *, end p2, k1. Row 6: K1, *p2, k1, drop next st off needle and unravel down to the yo six rows below; k1, p2, k1, yo, k1; rep from *, end p2, k1. Rows 7, 9, and 11: P1, *k2, p3, k2, p2; rep from *, end k2, p1. Rows 8 and 10: K1, *p2, k2, p2, k3; rep from *, end p2, k1. Row 12: K1, *p2, k1, yo, k1, p2, k1, drop next st off needle and unravel six rows down as before, k1; rep from *, end p2, k1. 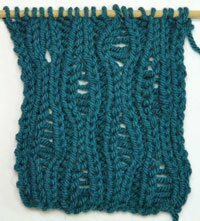 Row 5: K1, * insert needle into the next st and wrap yarn 4 times around the needle, then knit the st withdrawing all the wraps along with the needle. Rep from * on every st across row to last st, ending k1. 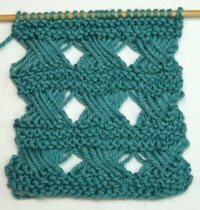 Row 6: *Sl 8 sts wyib, dropping all extra wraps, thus forming 8 long sts on right-hand needle. Then insert left-hand needle into the first 4 of these 8 long sts and pass them over the second 4 sts. Then return all sts to left-hand needle and knit the 8 sts in this crossed order, the 2nd 4 first and the original 4 next. Rep from * on each group of 8 sts. Row 12: Sl 4 sts dropping extra wraps, then cross 2 over 2 as in Row 6 and knit these 4; *sl 8, cross, and knit as in Row 6; rep from * on each group of 8 sts across row to last 4 sts, end by crossing 2 over 2. When I bought one of my special yarns, it was shown a scarf using the elongated stitch. It was so beautiful—I just have to have the yarn! I'm inspired by Eunny, as usual. In fact, the entire series 600 of Knitting Daily TV is full of information like this, you'll love it! And if you can't find KDTV on your PBS station, you can get the entire season now on DVD! Now I'm motivated to swatch one of these patterns! How about you? Which stitch is your favorite?